More than 100 million people suffer from dry eye syndrome, a benign yet bothersome condition that causes eye dryness, stinging and/or burning. Although several dry eye treatments (e.g., eye drops, punctal plugs, warm compresses) have long been available to treat the condition, they usually only provide temporary relief. Thanks to advances in eye care, an innovative treatment is available that provides long-lasting relief. The LipiFlow Thermal Pulsation system from TearScience is a non-invasive treatment that combines heat and gentle pressure to address dry eye at the root of the problem. If over-the-counter or prescription medications have not successfully addressed your dry eye symptoms, LipiFlow may help. Austin Eye is pleased to offer LipiFlow to patients who seek long-lasting relief from dry eye syndrome. LipiFlow is FDA approved to treat evaporative dry eye, the most common type of the condition. Evaporative dry eye occurs when the meibomian eyelid glands malfunction. The meibomian glands play a crucial role in preserving the health and function of the eyes. They secrete lipids (oils) to slow the evaporation of tears and therefore keep the eyes lubricated. In people with evaporative dry eye, the meibomian glands malfunction or become plugged and they stop producing lipids. As a result, the tears evaporate too quickly and cannot keep the eyes properly lubricated, leading to dry eye symptoms such as redness, burning, stinging, itchiness and blurred vision. People with serious cases of dry eye can experience difficulty reading, driving, using a computer or performing other everyday tasks. Dry eye can also make wearing contact lenses feel uncomfortable. Without proper treatment intervention, dry eye syndrome can progressively worsen. LipiFlow is a device used to treat meibomian gland dysfunction by clearing the obstructed glands to promote the natural flow of oils. The procedure is non-invasive and takes about 12 minutes per eye to complete. Depending on the severity of the case, our team of eye doctors may recommend a single treatment or several treatment sessions. During the treatment, a special eyepiece is placed under and over the eyelids. It applies precisely controlled heat to soften the hardened glands. At the same time, the LipiFlow system delivers gentle pulsed pressure to open and express the blocked glands, restoring gland function. The glands resume oil production and start to release oils to coat the eye’s tears, reducing dry eye symptoms. Studies have shown the safety and effectiveness of the LipiFlow system. One clinical study found that almost 80 percent of patients saw an improvement in their dry eye symptoms within two weeks. Patients also saw an improvement in the quality and quantity of meibomian gland secretions. Side effects with LipiFlow are rare and can include redness, stinging, burning, inflammation and red eyes. 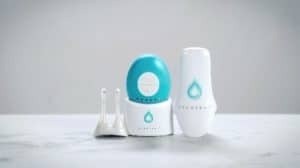 In addition to LipiFlow, Austin Eye now offers Allergan’s TrueTear Intranasal Tear Neurostimulator, an innovative and non-surgical treatment that uses neurostimulation to temporarily increase natural tear production. TrueTear is a handheld device that features two disposable tips that are inserted into the nasal cavity. The device delivers tiny, gentle pulses of energy to stimulate a nerve in the nasal cavity. The nerve sends signals to the brain to trigger temporary tear production. TrueTear is FDA-approved, easy to use and well-tolerated by adult patients. A member of our team would be glad to meet with you to discuss how TrueTear can help you find relief from dry eye. If uncomfortable symptoms of evaporative dry eye interfere with your everyday life, it’s time to try a long-lasting solution. The eye doctors at Austin Eye can evaluate your symptoms and determine whether LipiFlow is right for you. To schedule an appointment please call our North office at (512) 250-2020 or our Central office at (512) 454-2020.